For opening hours information, please contact the London North SmartCentre directly. London North SmartCentre offer more than 40 brand name stores. London North SmartCentre is located in London, Ontario - 1280 Fanshawe Park Road West, London, ON N6G 5B1 (GPS: 43.010265, -81.333568). 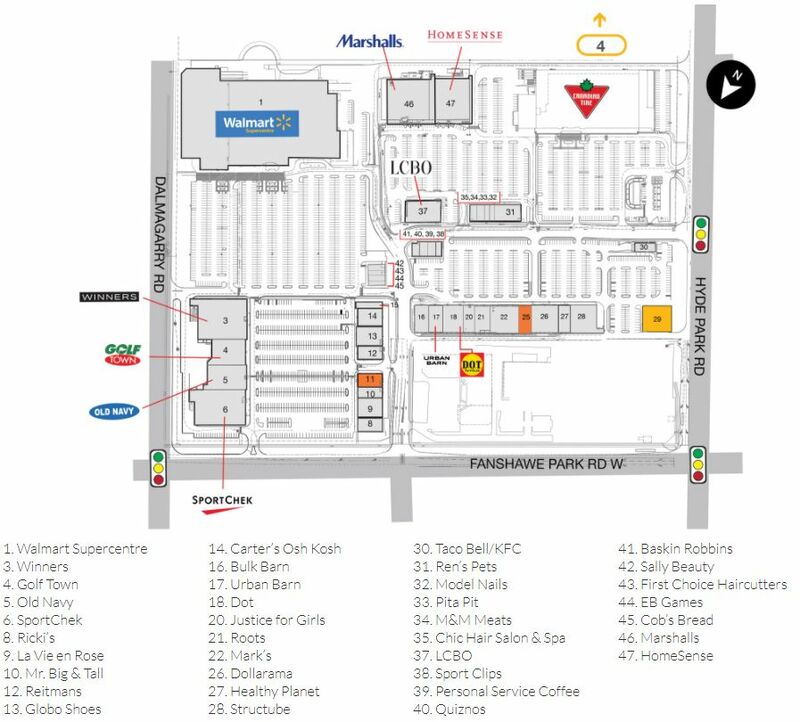 Look at the list of stores in London North SmartCentre , hours, location and information about mall and special events, sales, coupons. You can choose store from list below and get detail information - other stores locations for the brand, location, shopping hours, phone, map, directions contact. London North SmartCentre is one of the best shopping place for spend your free time - mall/shopping center has all types of stores - outlets, department, fashion, traditional and more. Have you ever visited London North SmartCentre ? Do not forget to write shopping review and rate your satisfaction. SmartCentres London North provides 600,000 square foot of shopping space. It is situated at the intersection of Hyde Park Road and Fanshawe Park Road West in London, ON. You can find here brands like Winners, HomeSense, SportChek, Old Navy and many more. The shopping center is located not far away from the center of London., on the corner of Fanshawe Park Road West and Stanton Dr.
Give us your experience with London North SmartCentre by writing a short review.